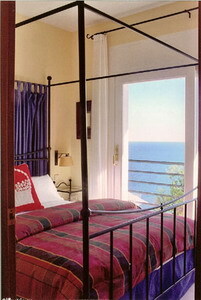 The villa is located in the Costa Brava just 64 kilometers (40 miles) north of Barcelona. 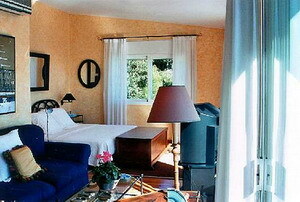 Excellent train service and good roads put all of Spain and Southern France's attractions within easy reach. This spacious 5,000 square foot villa was built in 1994. 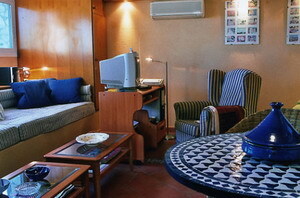 All of the rooms are air-conditioned and heated. 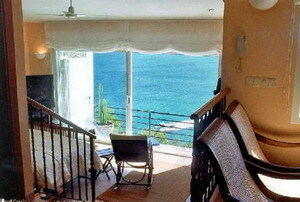 The villa is situated amidst a pine grove in a residential area with 24 hour security service. Residents may use the clubhouse and facilities with an Olympic-sized pool, tennis courts, and a restaurant on the beach. This beach is one of the quietest and most secluded of the Costa Brava. All rooms in the villa have sea views, double-glazed windows with screens, and the entire house is tastefully decorated with quality furnishings. Ground floor: a garage for two cars and elevator stop. The elevator makes 3 stops - one to the garage, one to the main floor and one to a master bedroom with bathroom en suite, so people with walking problems will have access. 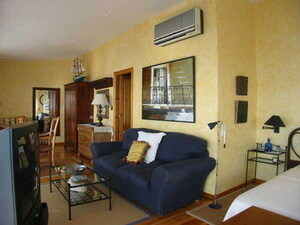 El Marinero (sleeps 2): This studio suite is upstairs from the garage and is decorated with long banquettes, creating the feeling of being on a ship. 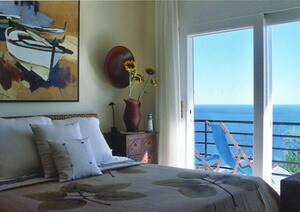 There is a queen-sized bed, satellite TV and music system, full bath, and a compact kitchen. 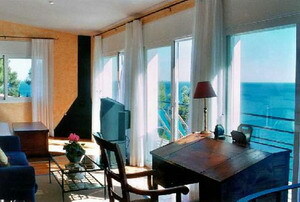 Two windows overlook the sea. First floor is the common area for everyone. The pool area on the first floor is backed by a 500 sq. 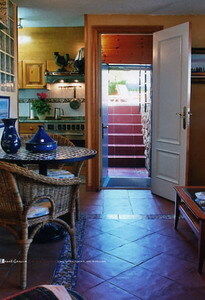 foot living/dining room, kitchenette, fireplace and bathroom. 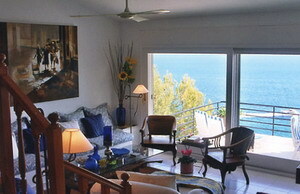 A 15 x 30 foot tiled swimming pool offers unobstructed views of this lovely part of the Mediterranean Sea. 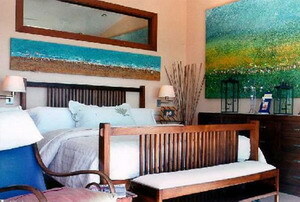 Second floor Monet (sleeps 4): This level has two bedrooms with queen-sized beds. 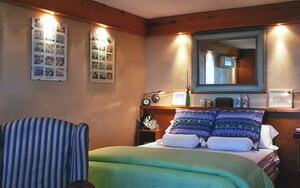 Both bedrooms have full marble bathrooms en suite. The kitchen is ultra modern, with marble countertops and every imaginable appliance and gadget.. 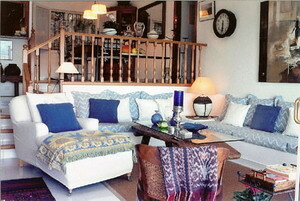 The living room, comfortably decorated with Spanish antiques, has a fireplace and satellite TV. A large glass door opens onto a patio where comfortable wooden chairs invite you to sit and enjoy the spectacular view in the sun or shade because of the electrically-operated awning. Up a spiral staircase is a gracious suite with a king-sized bed, fireplace, large satellite TV, and full marble bathroom with sunken Jacuzzi and two sinks. 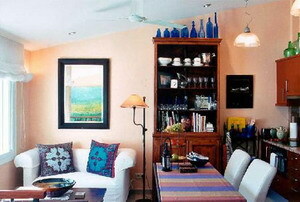 Guests have use of the kitchen cabinet in the common sitting area adjacent to the pool. This suite has a king bed, fireplace, large bathroom with jacuzzi, separate shower and a full kitchen/dining area and sofa, as well as a full-length balcony with table and chairs and awning. 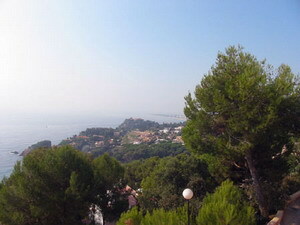 The view is of the sea and coast. The friendly, helpful owner lives nearby and is fluent in English. He is happy to greet the guests at the airport and can provide airport pickup, tours, tour information and sightseeing in his native Catalunya. He provides start-up supplies such as bottled water, bread, cheese, eggs, and of course, champagne. Guests love him! Additional maid service is available @ 15.00 per hour. 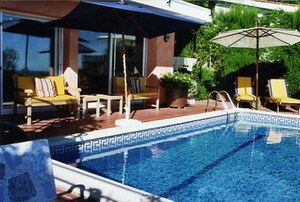 The rate includes all taxes, daily cleaning, pool and gardener services. 50% deposit required to hold your reservation when booking. The owner is available for tours and sightseeing in his native Catalunya.